SSMRF is delighted to announce we have been selected as the charity partner for the 43rd Sutherland Shire Mayoral Debutante Charity Ball. One of the premier events on the Sutherland Shire calendar, the 2019 Mayoral Ball will be held at the Sutherland Entertainment Centre on Saturday 25 May and is expected to attract over 300 guests. Sutherland Shire Mayor, Councillor Carmelo Pesce said the Mayoral Debutante Charity Ball is a long-standing tradition that celebrates the achievements of our young people while also giving back to a worthy charity. “I always look forward to the Mayoral Ball which is a great opportunity for our young students to step into the spotlight and show they are independent members of our community,” said Sutherland Shire Mayor, Councillor Carmelo Pesce. Established in 2007, the SSMRF offers medical research grant funding to assist doctors and other health professionals in conducting medical research at The Sutherland Hospital and St George Hospital with the aim to improve care and outcomes for patients and the wider community. “SSMRF is honoured to be chosen as the charity partner for 2019 and we look forward to working with the debutantes, community and local businesses to raise awareness and funds to support medical research in our local hospitals,” said Jacqui Stratford, CEO SSMRF. “One of the foundation’s main objectives is to support the next generation of researchers by providing vital seed funding of between $20,000 and $50,000 to get a great research idea off the ground. 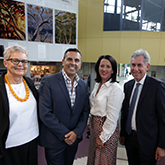 “On behalf of the foundation I would like to thank the Mayor and the Council for the opportunity be part of such a wonderful event that brings the Sutherland Shire community together,” Ms Stratford added. Associate Professor Peter Gonski, Director, Aged Care and Rehabilitation, Sutherland Hospital and South Eastern Sydney Local Health District and SSMRF Board Member, said we should all be proud of young people making the effort to help raise money for this important foundation. “Research in our local hospitals saves and improves the quality of lives, and encourages the best people to work with us,” Associate Professor Gonski said. Last year, with the help of local businesses and corporate support, over $22,000 was raised for the Kookaburra Kids Foundation, who provide support for children and families affected by mental illness. Council is now seeking support and sponsorship from community minded organisations to partner with us for this year’s Mayoral Debutante Charity Ball with corporate sponsorship packages available. If your business would like to support this important community event, call 02 9710 0996. “I urge you to dig deep to support this fantastic local charity,” Mayor Pesce said. Would you like to get involved or support this event?